Some days, even my lucky rocketship underpants don’t help. We here at Casa Fabulous hope that you had a wonderful Thanksgiving holiday. We were, alas, felled by plague, the likes of which I have not experienced in quite a long time. It started on Tuesday, and by Wednesday we had feverishly called off the next morning’s family gathering. We’re now on day #7, and just starting to round the corner and feel marginally well again. Oh thank goodness for bread mold, antibiotics are a wonderful thing. We did manage Thanksgiving dinner, though I did not manage to actually taste much of it (everything tastes like library paste when you’re this sick, face it) and the rest of the long holiday weekend passed in a Nyquil colored haze. 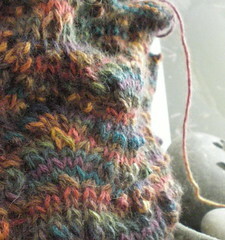 Cashmere Cowl II came off the needles. Alas, I discovered some “creative” variations on the lace pattern, but hopefully the recipient won’t notice. It’s Mountain Colors cashmere, I’m not sure what the colorway is called. It was a gift from a friend a few years back and the labels have long since been lost. I’d been saving it for something small and special. I think this fit the bill. It’s so soft, just like a dream. A lovely, toasty little bit of luxury for someone to tuck into a collar on a chilly morning. 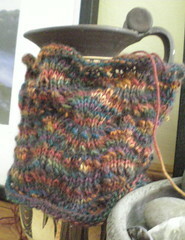 It wants blocked, and then it will join the other cowl in my rapidly growing pile of holiday gifties. February Lady seemed like pretty good Nyquil knitting. So far, so good. I think it’s going well. I’m using Dream in Color Classy, in the colorway In Vino Veritas, and really loving it. The lace will make it the perfect winter sweater for Southern California. Not too bulky and hot. 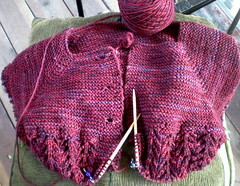 My Nyquil brain totally f-ed up the raglan increases so I don’t have pretty yarnovers, but rather, a solid fabric. That’s ok. It works and it looks fine and that’s what matters, right? So now we’re into December. Four months into the school year, a month away from the New Year, 28 days from my 39th birthday, and the world ain’t slowin’ down. It seems like just a few weeks ago I decided I was going to knit 12 pairs of socks this year. Which I totally haven’t done, for the record. I think I’ll just sit here in my comfy chair with some tea, the kittens, and a box of kleenex for another day or two, and see how it goes. I’ll catch up tomorrow, maybe. 5 Responses to Some days, even my lucky rocketship underpants don’t help. Hopefully the creeping crud buggers off soon. FLS looks great! Sorry you’re all sick! I have a head cold, but am hoping that that means this year I won’t be deathly ill over Christmas vacation, which we all were last year. Traveling on the redeye with two children with pinkeye and barely ambulatory myself was no picnic. And I shudder to think what the other passengers were whispering. Nice cowl and sweater. But please don’t show me any February Lady pictures any more (kidding). I have startitis in the worst way and absolutely CANNOT do it. I have enough yarn for two of these in the stash and it all queued up and everything! Not fair! Lynda has a good point, when are you having a spin-in at the new place?